Photographers in photo shoot productions in Montreal and the Quebec province regions. We are responsible for the logistics and details of art directed shoots. We are thorough, resourceful, detail orientated, have excellent phone manner and able to prioritize. We, as well, are responsible, flexible with changes, prepared to work long hours and weekends as needed. At Montreal Photography Production Services we concentrate on the whole production details, which include booking travel/transportation, assembling crews, booking castings, rental of equipment, obtaining the necessary permits, buying insurances, organizing customs, catering details, finds props, books motor homes, assistants, digital tech, stylists, hair dressers, makeup artists, etc... Our competent production crew also sees to all other details that are needed for a successful production. We work on all kinds of productions – from editorial shootings that usually only need a little assistance to complex productions that require support during the whole shooting. Montreal Photography Production Services location scouts also makes us the specialist for finding locations in our area which is usually done at, or before the start of the per-production stage. 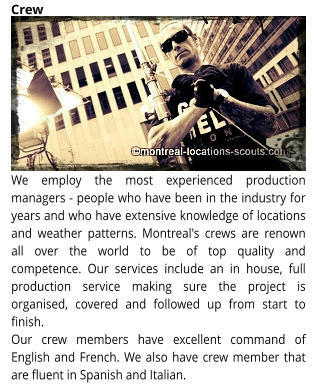 Let them be Photography Production Managers, Photo Shoots Producers, Montreal Location Scouts, Location Scouting Photographers, Location Managers, Stylist, Wardrobe Mistress, Drivers, Montreal Photo Production is your "one email" away source for all your Canadian Photography productions projects. 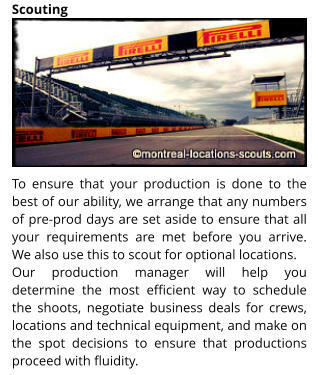 According to your brief and our pre- production debriefing, we arrange castings to fit in with your schedule. 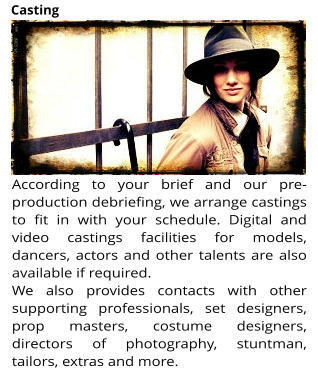 Digital and video castings facilities for models, dancers, actors and other talents are also available if required. 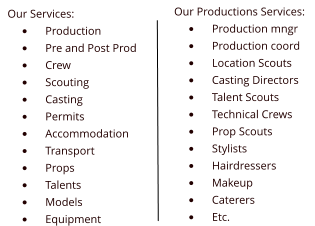 We also provides contacts with other supporting professionals, set designers, prop masters, costume designers, directors of photography, stuntman, tailors, extras and more. 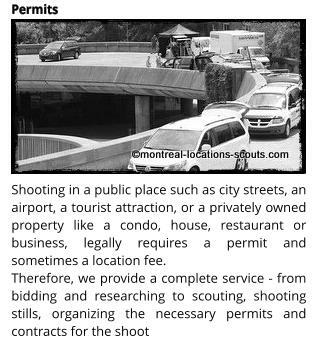 Shooting in a public place such as city streets, an airport, a tourist attraction, or a privately owned property like a condo, house, restaurant or business, legally requires a permit and sometimes a location fee. Therefore, we provide a complete service - from bidding and researching to scouting, shooting stills, organizing the necessary permits and contracts that will allow the shoot to take place. 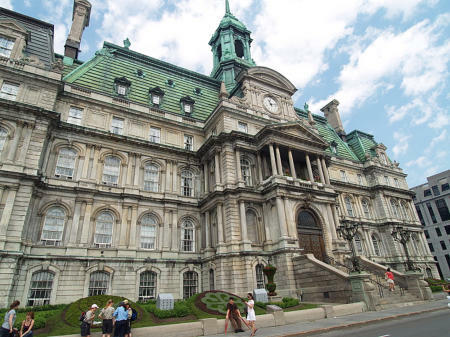 Apartments, Guest Houses, Hotels and Beautiful Private Homes are available in and around Montreal. Our knowledgeable staff will take care of your accommodation needs making sure everyone involved in the project has a nice place to stay. We always try our best to book hotels as close as we can to the shooting location. By doing so we can make you save time and transportation fees. To ensure that your production is done to the best of our ability, we arrange that any numbers of pre-prod days are set aside to ensure that all your requirements are met before you arrive. We also use this to scout for optional locations. 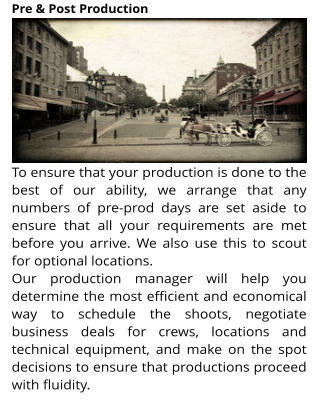 Our experienced production manager will help you determine the most efficient and economical way to schedule the shoots, negotiate business deals for crews, locations and technical equipment, and make on the spot production decisions to ensure that productions proceed with fluidity. We employ the most experienced production managers - people who have been in the industry for years and who have extensive knowledge of locations and weather patterns. 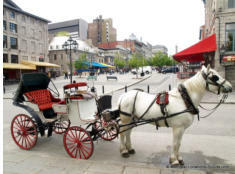 Montreal's crews are renown all over the world to be of top quality and competence. Our services include an in house, full production service making sure the project is organised, covered and followed up from start to finish. Our crew members have excellent command of English and French. We also have crew member that are fluent in Spanish and Italian. According to your brief we arrange a location scouting to fit in with your schedule. Digital and video scouting facilities are also available if required. 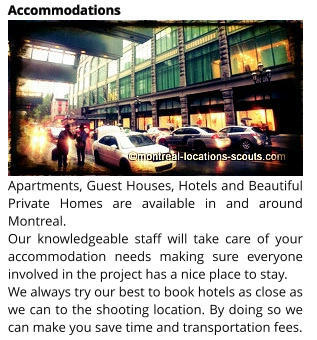 The Best Location Service and Location Scouts in Montreal/Quebec. Our locations scouts will find near exact locations based on the briefs/storyboards we receive. With our experienced location managers we are sure to find whatever location you require, we’ll take care of all the paper work and permits. 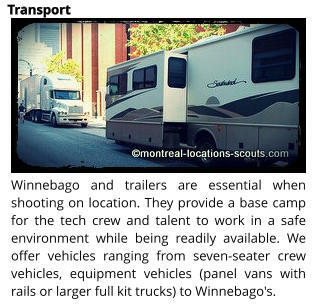 Winnebago and trailers are essential when shooting on location. They provide a base camp for the tech crew and talent to work in a safe environment while being readily available right on set. We offer vehicles ranging from seven-seater crew vehicles, equipment vehicles (panel vans with rails or larger full kit trucks) to Winnebago's. There are numerous prop houses and private enterprises from which anything imaginable can be rented. 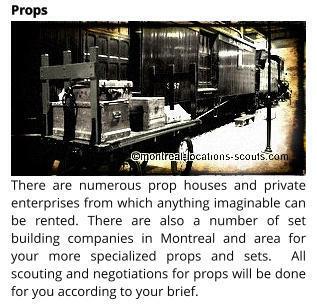 There are also a number of set building companies in Montreal and area for your more specialized props and sets. All scouting and negotiations for props will be done for you according to your brief. 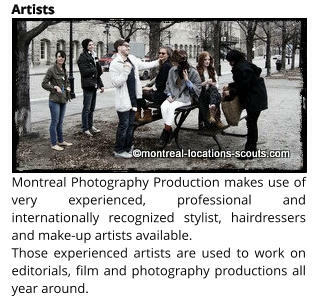 Montreal Photography Production makes use of very experienced, professional and internationally recognized stylist, hairdressers and make-up artists available. Those experienced artists are used to work on editorials, film and photography productions all year around. With plenty of Model Agencies in Montreal representing the many world class international and local models, there is an abundance of talent available. Montreal being a multicultural city the choice of models of different ethnics is abundant. 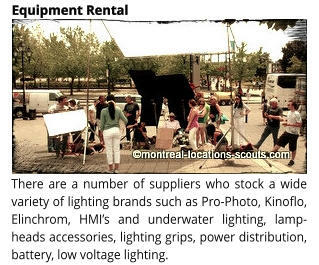 There are a number of suppliers who stock a wide variety of lighting brands such as Pro- Photo, Kinoflo, Elinchrom, HMI’s and underwater lighting, lamp-heads accessories, lighting grips, power distribution, battery, low voltage lighting. For some people, it’s strictly Montreal's gourmet food, for others, it’s Italian, Chinese or Indian food. We will make arrangements for catering to satisfy all tastes, diets and budgets. 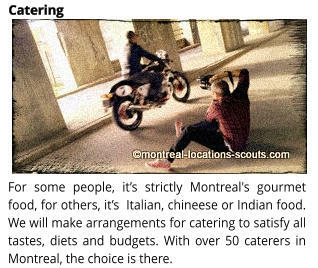 With over 50 caterers in Montreal, the choice is there. Montreal Photography Productions.com is the Montreal primary source in answer to all your needs for your photo shoots in the Montreal region and Quebec province. Let them be Photography Production Managers, Photo Shoots Producers, Still Photos Producers, Montreal Location Scouts, Location Scouting Photographers; Montreal Photo Production is your "one email" away source for all your Canadian Photography productions projects. Montreal Photography Productions. is the primary source in answer to all your needs for your photo shoots in the Montreal region and Quebec province. 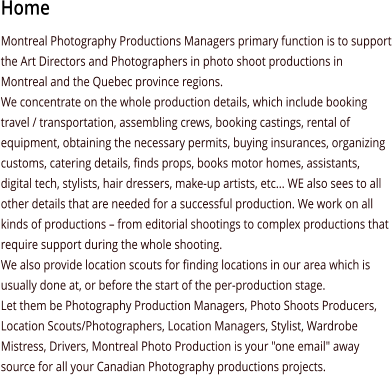 Let them be Photography Production Managers, Photo Shoots Producers, Still Photos Producers, Montreal Location Scouts, Location Scouting Photographers; Montreal Photo Production is your "one email" away source for all your Canadian Photography productions projects.